. إن بست ويسترن بلس كيرنز سنترال أبارتمنتس حريص على توفير الراحة للنزلاء، فلا يوفر الموظفون جهداً في تقديم أفضل الخدمات وضمان حسن الاستقبال. لضمان راحة ضيوفه، يقدم الفندق الخدمات التالية: واي فاي مجاني في جميع الغرف, مجهز لذوي الإحتياجات الخاصة, مرافق مخصصة لذوي الاحتياجات الخاصة, تسجيل وصول/خروج سريع, تخزين الأمتعة . تتضمن كل غرف النزلاء وسائل الراحة والتسلية المصممة خصيصاً لضمان الراحة القصوى للضيوف. كما أن مجموعة الخدمات الواسعة الموجودة في الفندق لضمان راحتك تترك لك الكثير من الخيارات لقضاء وقتك أثناء فترة إقامتك. مهما كانت دواعي سفرك فإن بست ويسترن بلس كيرنز سنترال أبارتمنتس هو خيار ممتاز لإقامتك في كيرنز. The Apartment is very clean and secure, staffs are very helpful and friendly. We really enjoyed staying in the apartment. It located right next to the shopping center. The kitchen in the apartment is well equipped. It's only a short walk to the Esplanade. Where you can find lot of restaurants and Cafes. Right outside the apartment has a bus stop which cover many buses which goes around the area. The pool and spa is also very nice on the top floor. A very nice place to stay. But there is one thing which I thought it will make the apartment become 5 stars if the internet can be more stable. Although it has Wifi provided to all rooms. But most of the time you will not be able to connect. You need to go down to the lobby. The location of the hotel is excellent! love it! just a stone throw away is coles, k mart and target in the city centre. walking distance to esplande and night market. near mall. helpful staff. clean room. great stay. the staff was very helpful. had to find space to park my bags (many) before my check-in as going for a morning scenic heli flight. had to trouble staff to open holding room for luggages couple of times as we need to get things here and then. staff did not complain and serviced with a smile. lovely attitude. I stayed here for 4 nights and upon my arrival I read through their information which states you have a few items like tea/coffee/sugar to get you going however buy your own once they've gone. I'm ok with that, however I was given 2 towels, 2 hand towels and a bath mat....this is not sufficient when staying for 4 nights. Also on the first night one of the rooms there decided to have a bit of a party so it was hard to sleep even though there was sufficient signage to let patrons know this was unacceptable. Kind staff, clean rooms and verity facilities. This was a good hotel, 5-15 min walk to markets, restaurants and esplanade, and directly across the road from shopping centre. The hotel classifies itself as 4.5 star, I would say 4 star, as it has reduced office hours, no breakfast options, no room cleaning during our 3 night stay, only one chair on balcony, no off street parking to check in. However room was clean and well set out, but a little small. My main issue though is the lack of sound proofing through the unused interconnecting door to the next room. We could hear all their activities in kitchen and laundry, luckily they were a quiet family, and we we also respectful to them, but this would not always be the case. The hotel was not full, far from it, so why put people in rooms next to each other which have interconnecting doors, reducing privacy? But small rooms set along narrower corridors. If you have large pieces of luggage u will struggle to get thru the corridors, let alone the room. Unhelpful front desk staff when we asked if they can spare us some rope to tie up a box we were planning to ship home. We only stayed a night...not suitable for any longer stay. I stayed 2 night in hotel room, and 1 night in 1 bed room apartment room. hotel room was good, and 1 bed room was really nice. You have to stay apartment as the prices are not very different. minus - Working hour of of this hotel reception is not 24 hrs. Was not happy that the room I booked through Agoda was not the room we were booked into.However, the staff were very accommodating and upgraded us to the room I had booked according to the Agoda site. The room was very clean, central to everything, the bed very comfortable. Located opposite the mall, you get Target, K-mart, Supermarkets and plenty cafes. this makes up for the restaurant not having dining options. It is about 10-15 min walk to the Esplanade which can be a bit of a quiet stretch at night. The room is very clean and excellent kitchenette and toilet. Do note making up of the room is at a cost. So for those in for a long stay, you might have to fork up some money for housekeeping. Internet is fast. Friendly reception desk. Size of rooms, service from staff, easy to find. We were only at the Best Western Plus for one night as we were on our way to Port Douglas. It was a nice surprise to find it as big as it was. I had booked 2 rooms for our family of 4. The only negative was how far it was from the esplanade. Very close to the mall but too far to walk at night with kids to the main dining area. 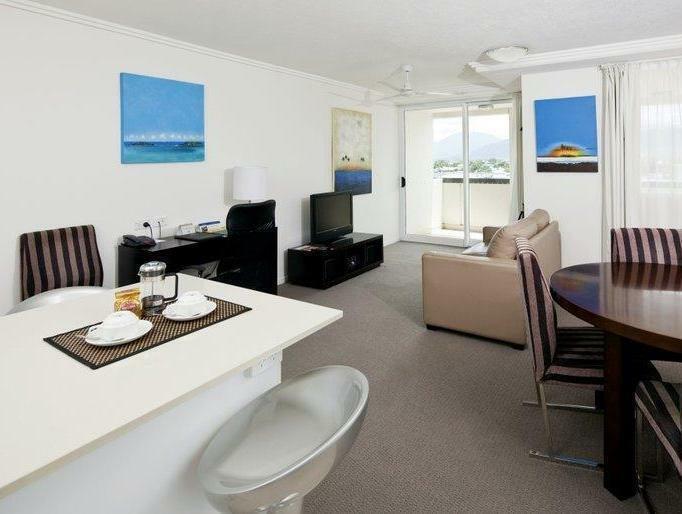 We stayed at the Best Western Plus Cairns Central Apartments for 6 nights in late May 2015. Our sea-view apartment was on the 11th floor: it was spacious, well equipped and boasted a large private balcony. 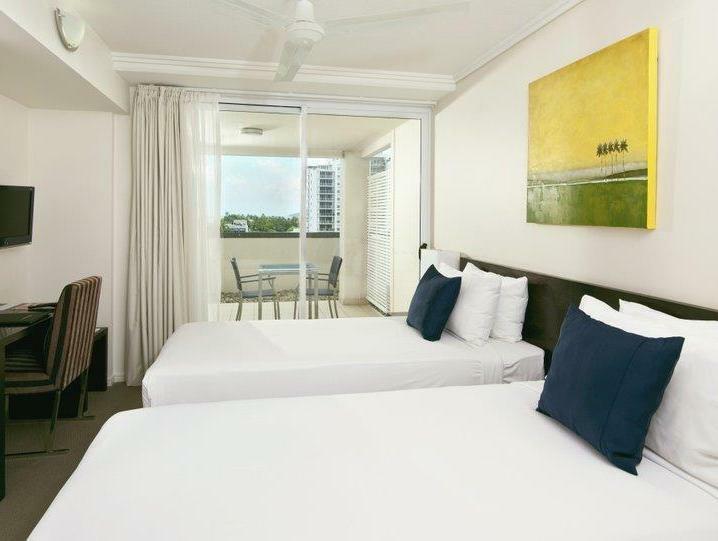 Some might consider that a stay of 6 nights without a change of bed linen is too long for a facility grading itself as 4 star but, with this sole exception, our stay was excellent and we would certainly use the Best Western Plus Cairns Central Apartments on future visits to Cairns. stayed for a night just on transit for our live on board dive trip. brilliant location and clean/comfy rooms. nothing to fault and would recommend for longer stays. however, cairns city itself does not offer much so its best to travel around to see its beautiful nature (ocean and rainforest)! I enjoyed my stay although we arrived after 3pm on a Sunday so reception was closed and we had no idea how to get in. The tv in the room was horrid and there was no channel list for the Austar so we had no idea which channel was which. There was also a channel to watch people walking in and out the front door which was kind of creepy. But overal for the price the hotel was okay. I really enjoyed my stay here. Its clean, modern and has great views from the balcony if your room faces the ocean. Its in a good location, centre to the CBD but far away so you don't get the noise. 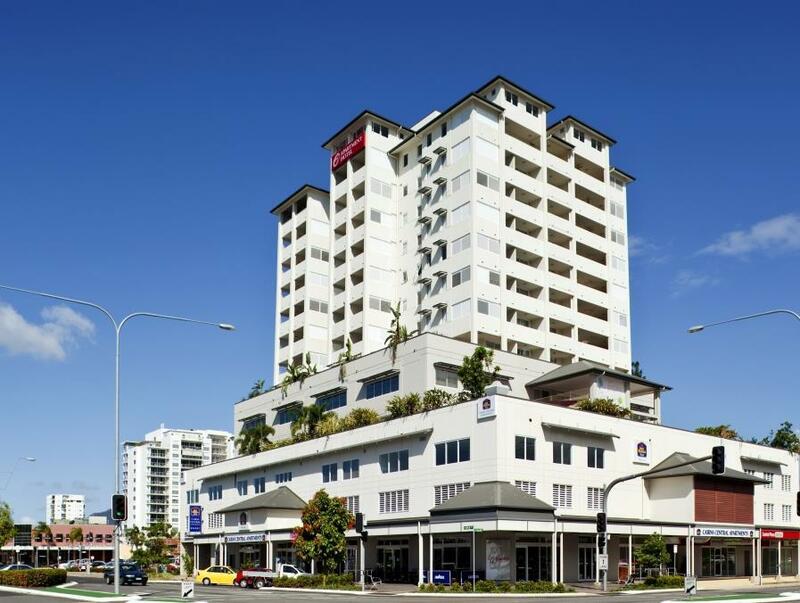 The shopping centre, Cairns Centre is opposite which is really convenient for supermarket shopping. There is also the Rusty's food market not far away - about 5 min walk away. The reception staff are quite helpful too. The negatives - No regular room servicing; the wifi is extremely slow; they close early on Sundays so if you have checked out and want to leave your luggage with them whilst you are out, you have to return before closing to retrieve the luggage before 2.30pm. Then you are stuck with your luggage until you leave.